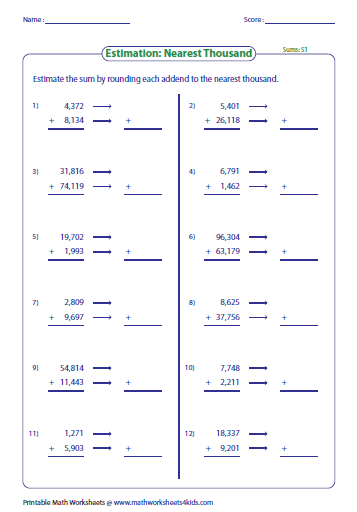 Estimate the value by rounding each number to the nearest ten. 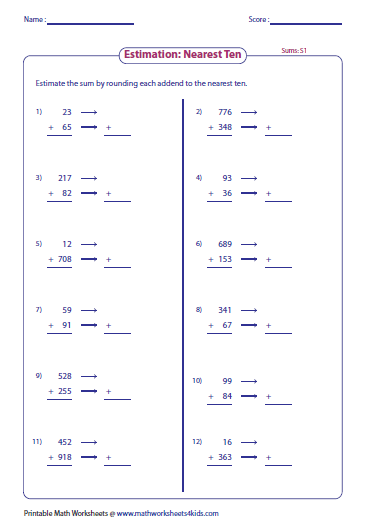 Level 1 and Level 2 have worksheets to estimate the sum and difference respectively. Level 3 contains mixed operations. 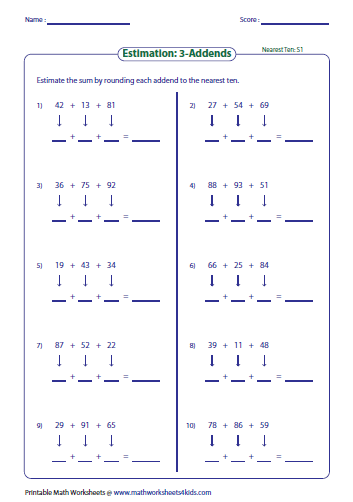 Round each number to the nearest hundred and estimate the sum and difference in all the worksheets. Estimate the sum or difference by rounding the numbers to the nearest thousand. Level 3 has multi-digit numbers to perform mixed operations. 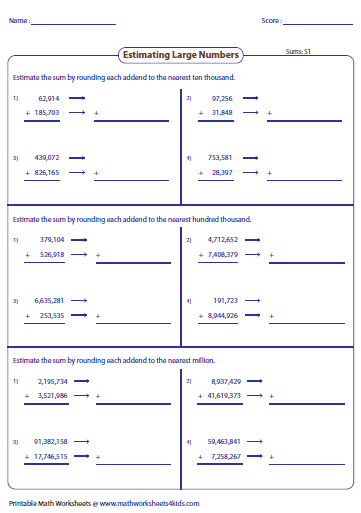 Each level has three exclusive worksheets to estimate values by rounding each number to its nearest ten thousand and million. 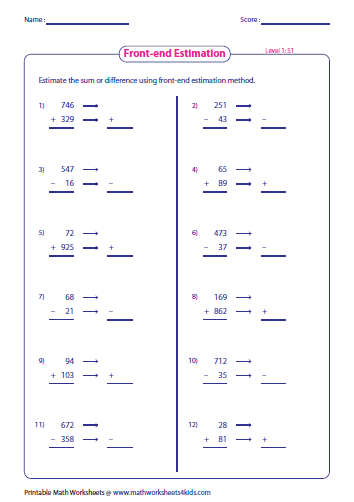 Use front-end estimation method to round the given numbers and thereby find the sum and difference in each worksheet. Round the numbers to the nearest hundred in level 1 and to the nearest ten thousand in level 2. 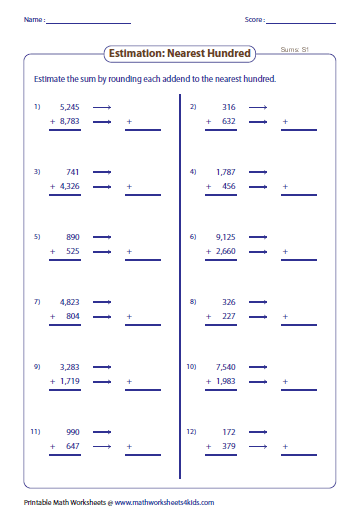 Round the three addends to the nearest ten in level 1 and to the nearest thousand in level 2 and estimate their sum. Perform numerical operations and estimate the value in each problem. 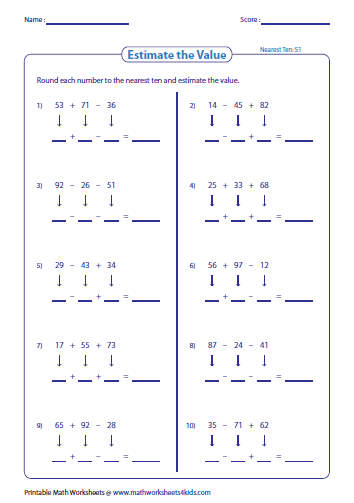 Round each number to the nearest ten in level 1 and to the nearest hundred in level 2.